Our Holland trip started with a overnight stay in the city of hull. We had a nice premiere inn near to the river Humber and it was only a short walk into the city. First place we went to was a bar for a pint or two to keep the cold out and then we started to walk around the old city. Hull has some great old buildings some of the best we have seen in England, and we could have done with a few days here to have a good look around. Had a visit to the deep in hull. This is a fish aquarium and cost about £25 to get in and well worth the money. It has a main tank that holds 2.3 million litres of water with sharks and loads of fish. It's done on multiple levels where you start at the top and work your way down. There were thousands of bloody kids about but they were enjoying it - some info here - The Deep is a public aquarium situated at Sammy's Point, at the confluence of the River Hull and the Humber estuary in Hull, England. It opened in March 2002. Billed as "the world's only submarium", the tanks contain thousands of sea creatures (including seven species of shark), 2,500,000 litres (550,000 imp gal; 660,000 US gal) of water and 87 tonnes (96 short tons; 86 long tons) of salt housed in a building designed by Sir Terry Farrell and built as part of the UK National Lottery's Millennium Commission project. The Deep is also a landmark centre for marine research. Staff marine biologists look after the animals in The Deep's collection as well as carrying out research into the marine environment. 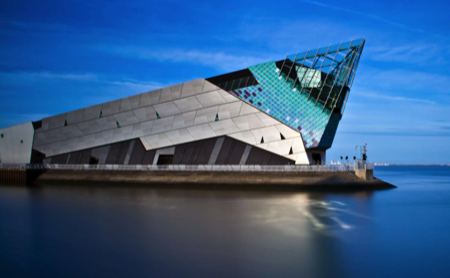 In 2013, the aquarium was voted the best family place to visit in Hull. 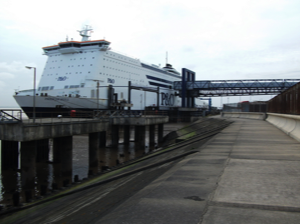 On Saturday Afternoon we made our way to the Europort at the Port of Hull for our crossing to Rotterdam Holland. We boarded our boat at around 15:50 and unpacked in the small but clean and tidy cabin for the overnight trip across the North Sea luckily the weather looked promising. The Boat was called the Pride of Hull and was enormous but luckily not that many people, out of season so it was nice and quiet onboard. I suggest if you make the trip to Purchase the meal package before hand as it is cheaper and consists of a good all you can eat buffet and the same with the breakfast. There are loads of bars, shops, cinema and a casino to keep you entertained throughout the night. From Wikipedia : Pride of Hull was designed as two ships in one, both a car ferry and a cargo transporter, with three large freight decks, loaded by a single stern door and a car deck, on deck 7, loaded via a side ramp. She is 215.05 m (705 ft 7 in) long with a beam of 31.85 m (104 ft 6 in) and a draught of 6.04 m (19 ft 10 in). She is powered by four Wärtsilä 9L46C diesel engines which have a total power output of 37,800 kilowatts (50,700 hp) which can propel her at 22 knots (41 km/h). She has two bow thrusters, two stabilisers and twin rudders. With Mampaey quick release disc type towing hook. After the bus journey from the ferry port we arrived in the city of Rotterdam. First impressions were good when we stopped for a nice coffee as we explored the city. People are very friendly and the place is very clean and tidy. The city is very new and is surrounded by large modern buildings one called the red Apple, and is worth the visit. 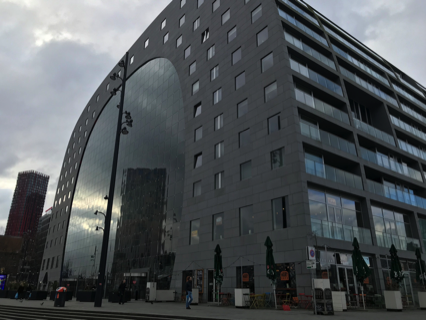 Inside the centre of Rotterdam you find a large building called the Market hall and inside you will find a large market that sells a fantastic selection of foods from around the world. There is a massive selection of cheese and hams , and also some great beers we had some great wheat beer. 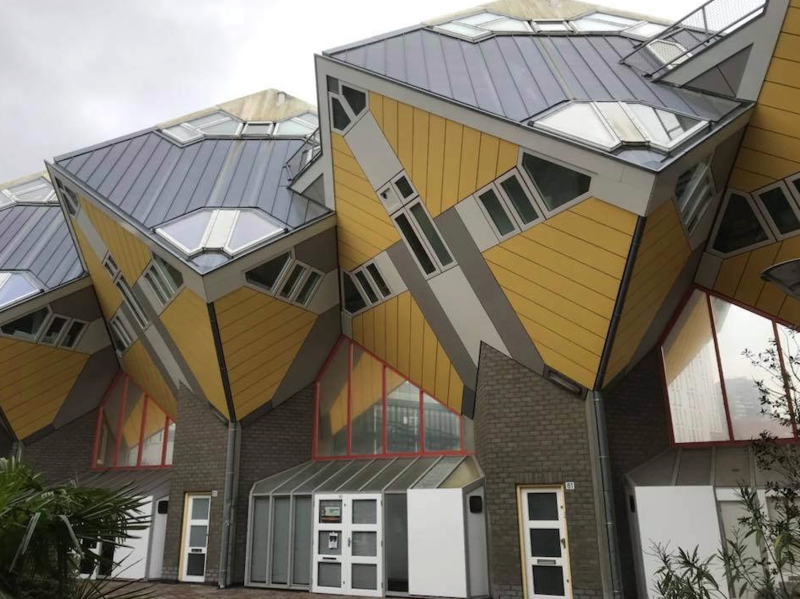 Some fantastic modern architecture adorns the Dutch city. Some very strange like the cubed building above with the red Apple apartments behind it. The cube houses are fantastic with one being a museum show house, thease strange houses built in the 80,s are well worth a look you get some great perspective angles looking through the multitude of windows I’m glad I took my camera. As we waited for the bus the cold did started to bite, I have never felt so cold. We had another coffee before walking towards the bus station and off back towards the boat. We did like Rotterdam a great modern city and a great trip.